Breynia belongs to the Phyllanthaceae, Malpighiales. In Arabidopsis thaliana var2 mutant, white leaves are formed because of the delay of chloroplast development. Chloroplasts gradually differentiate from proplastids and leaves gradually turn to be in green (Sakamoto et al. 2009). VAR2 gene encodes a proteinase and degradation of some proteins is necessary for proper chloroplast development (Liu et al. 2010). 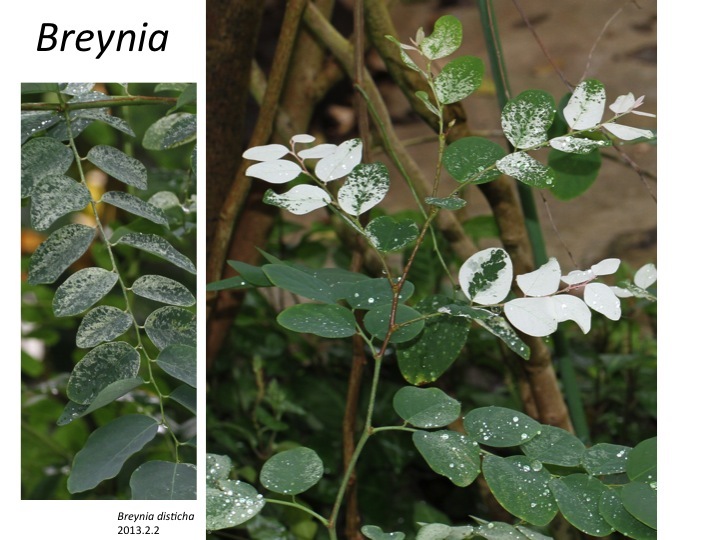 Breynia is not so closely related to Arabidopsis thaliana, but their variegated leaves may be formed with similar mechanisms. Liu, X., Yu, F., and Rodermel, S. (2010). Arabidopsis chloroplast FtsH, var2 and suppressors of var2 leaf variegation: a review. J Integr Plant Biol 52, 750-761. Sakamoto, W., Uno, Y., Zhang, Q., Miura, E., Kato, Y., and Sodmergen (2009). Arrested differentiation of proplastids into chloroplasts in variegated leaves characterized by plastid ultrastructure and nucleoid morphology. Plant Cell Physiol 50, 2069-2083.